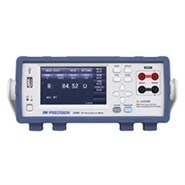 The 2840 Series DC resistance meters feature high accuracy and resolution measurements in the milliohm range. Both meters are ideally suited for measuring contact resistance of relays, switches, and PCB traces, typically outside the resistance range of multimeters. The vivid 4.3-inch TFT LCD color touch screen and keypad provide intuitive operation. Both models feature low power resistance testing (LPR) modes and variable measurement speeds that are suited for a wide range of applications. The handler interface with high-speed measurement capabilities enable the 2840 Series to evaluate a large quantity of components and be integrated into an automated test system.